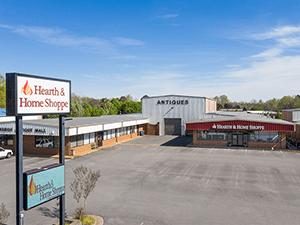 For more than 25 years, Hearth and Home Shoppe has been serving greater Richmond, Virginia with a wide variety of hearth products and services. Close to the 'windmill', Hearth and Home Shoppe has been located in the Village of Mechanicsville since 1987. This retail space originally housed a hardware store, became a furniture store, and then evolved into a stove store. 8154 Mechanicsville Turnpike has been our home ever since. Though filled with historical significance and charm, Hearth and Home Shoppe currently houses a spacious and contemporary showroom with over 50 displays of gas, wood, pellet, and electric fireplaces, inserts, stoves, and gas logs, as well as numerous fireplace doors, screens, and other accessories. A gorgeous outdoor kitchen display is located just inside our showroom, complete with a state-of-the-art Firemagic grill, refrigerator and other outdoor, stainless steel appliances. As part of the Partner Build program, Hearth and Home Shoppe funded the repairs and dedicated a day for our service technicians to assist a local homeowner with home repair projects. Hearth and Home Shoppe donated tools for use during this week-long youth mission project to assist local homeowners with needed home repairs. Hearth and Home Shoppe is happy to remove old but still useful hearth products from our customers' homes and deliver them to the Hanover Habitat for Humanity Re-Store. The Re-Store then mails a receipt for the donation to the customer.